Tell us how to do it already! 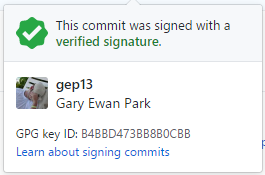 Yesterday, for the second time I had to sit down and figure out how to set up signing on my GitHub commits using the GPG Key which is provided by keybase.io, so it is time to write it down so that I don't forget how to do it again. Almost all the steps that I follow are taken from this blog post from Jan De Dobbeleer, so kudos to him for writing it up in the first place. I already have a keybase.io account, and therefore the steps involved in setting that up are not covered here, but in truth, it is very simple. Head on over to their site and walk through the process. With these steps done, I am ready to continue with setting up git to use the new gpg key. This is due to the fact that I have already imported the public key into GitHub. If you haven't done that part yet, then I would encourage you to follow the steps on the linked blog post. choco install gep13.gitConfig --source "'https://www.myget.org/F/gep13/api/v2;https://chocolatey.org/api/v2/'"
and all my git configuration will be applied, including setting up signing on commits, and my default merge/diff tools, etc. If you are interested in the commands that I execute, you can find them all here.